The New Moon in April 2012 is a prime time to relax into the natural state of abundance, April 21 at 12:20 pm Pacific. Exact time and date depends on your time zone (click here for more time zones). 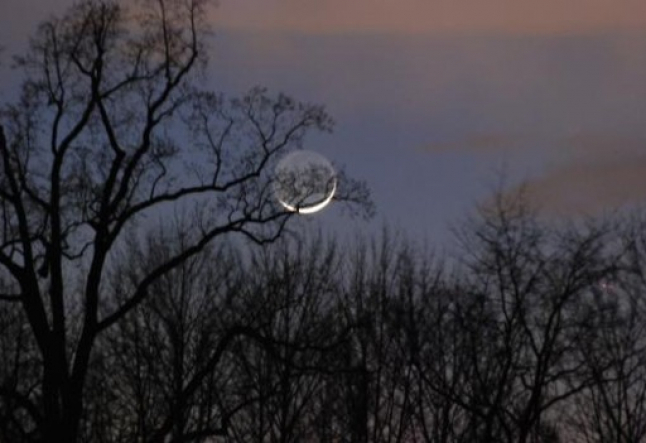 Originally, the phrase “New Moon” meant the first visible crescent of the Moon to appear over the western horizon. Therefore (as always), the precise time of the New Moon is influenced by your geographical location. April 21, 2012 (Western astrology, tropical zodiac), New Moon in Taurus = Neck. Yogastrology theme for everyone in the month of Taurus = Abundance. April 21 New Moon in Jyotish or Vedic astrology, sidereal zodiac, in Aries = Head; Yogastrology theme for Aries = Relaxation. Don’t be. All that really matters is that we take command of richness in our lives. How? Practice, practice, practice relaxing into the state of abundance that’s already there. We feel genuinely richer when we awaken, here and now, in the physical world. And New Moon in Taurus is the ideal time to “come to our senses” with this. This April 21 New Moon — claimed to be one of the “richest” of the entire year (thanks to Taurus and Venus, Mars, and Pluto) — provides the perfect opportunity. Stretch the neck in every direction; moving meditation, mmm... try it. Repeat a deeply resonant, throaty OM, a sacred mantra prized for its capacity to release the chatterbox known as “the mind” and invigorate the magnificent 5th chakra. The Sanskrit name for the 5th chakra (subtle-body energy center) is Vishuddha, which means purity. With the 5th chakra, we begin our ascent into the upper realms. The 5th chakra is the first of seven main chakras to focus primarily on the spiritual plane. Located in the neck and throat, the 5th chakra governs speaking and listening, and communication and the voice. This chakra is purified by the repetition of OM. As the 5th chakra becomes increasingly purer, we begin to understand our own inner truth. And we are able to speak our truth much more easily. These two simple practices bring about a mystical shift into what’s known as abundance consciousness, the key to genuine abundance. It’s that simple. And that’s my 5th chakra speaking, directly to you.